(L-R): MPs David Abala (Ngora County), Okello Alito wod Oceng (Kole North) and Solomon Silwany (Bukhooli Central). Photo by Vincent Kasozi. 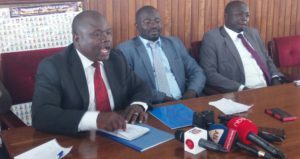 A section of NRM MPs have given the government a 30-day ultimatum to disband or merge inefficient government agencies and statutory authorities. The MPs led by the deputy chairperson of the NRM caucus Solomon Silwany have relied on reports that detail wasteful expenditure, financial hemorrhage and duplication of services caused by these agencies. They have announced that they will table a private members bill to eliminate these agencies should the government fail to act within the time frame they have specified. Silwany was accompanied by a number of MPs including David Abala (Ngora County), Okello Alito wod Oceng (Kole North), Fred Baseke (Ntenjeru North) and others. Silwany notes that the government must kick start the restructuring process immediately. “So we want a process of streamlining and today we are going to give the government a deadline,” Silwany announced. Most of the MPs were critical of the conduct of Uganda National Roads Authority (UNRA) which they accused of gross negligence and inefficiency. David Abala cited the Nakalama – Mbale road where works have failed to kick off despite constant pleas to the roads authority. Silwany says UNRA is merely an office that gives out contracts without performing any value addition. “UNRA has become a contracting firm that is not doing any work for Ugandans ….all the roads have collapsed….we want UNRA to go back to the ministry of works,” he stated. The MPs contend that bosses at these statutory bodies have enormous budgets for leisure and entertainment and other expenditure like consultancy and workshops which money would be put to better use in alleviating poverty. Government agencies like UNRA and the Uganda Communications Commission (UCC), which are semi-autonomous, determine the pay of their staff and their wage bills have often been a source of controversy with other civil servants demanding salary increment. “Can’t Shs190b pay doctors? This is what doctors are crying for,” he exclaimed. Alito wod Oceng condemned the huge expenditure on workshops and listed the agencies with the highest amounts wasted on workshops as NARO – shs5.4bn, UBOS – shs5.3bn, NAADS – shs3bn, UNEB – shs2.2bn and NEMA – shs1.9bn. They also accuse the heads of these bodies of defying directives and behaving in a superior manner to the ministers who are meant to supervise them. The MPs have called for some of these statutory bodies like UNRA and NMS to revert back to their mother ministries. The Executive Director of UNRA Allen Kagina is one of those bosses whom the MPs have been particularly critical of. “That lady as we talk now is more powerful that the minister, she is even more powerful that the president…. How do have different power centers like this? I have no sympathy for some of these agencies that have really caused a problem to Ugandans,” David Abala remarked. Another Executive Director who was harshly criticized by the MPs is Moses Kamabare the head of the National Medical stores. The MPs called for the medical stores to be transformed into a department under the ministry of health to ease supervision. Kamabare was also singled out as having become too powerful to control. “The executive Director of NMS even the minister for health she fears him, because he talks with authority and power,” said Herbert Kinobe the MP for Kibuku County. Silwany says they will deliver the ultimatum to the Prime Minister’s office this afternoon. In August this year President Museveni ordered for a review of the public service with a view of scrapping, downsizing and merging government agencies and Authorities in a move he said will deal with wastage of meagre resources. However Museveni did not specify which government agencies will either be downsized, scrapped or merged.